Most of the work involved when it comes to lifting your garage door is performed by the kinetic energy stored in the springs. However, if your opener unit fails to respond, your door isn’t going to budge unless you manually open it up. Fortunately, our team is on hand to get your door in proper working order again. 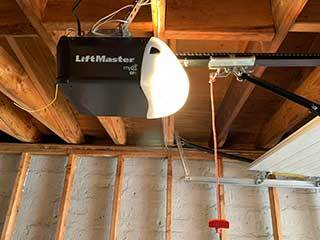 There are a lot of options for automatic garage door openers on the market today, covering a large range of prices, noise levels and extra features. Our team is familiar with the products of all the major manufacturers and we maintain a large inventory of spare parts. Whatever kind of system you have set up, you can rest assured our team can work with it. If your opener has been slow to work, or if it's been making strange noises while operating, it's a good idea to get it looked at ASAP. Grinding sounds indicate a likely problem with the motor or trolley cables that will only get worse with further use. If your opener is slow to respond, it could be an electrical problem, or an issue with your remote control system. Waiting for things to get worse is likely to mean more aggravation and expense down the line. Often, a faulty opener can be fixed by removing an obstruction from its motor, cleaning its wires and circuit boards, or replacing a bad wire or motor gear. In the event that your opener can’t be fixed, our team will happily advise you on suitable replacements to fit your needs and price range. If we have it in stock, we’ll install it at your soonest convenience. If we don’t, we’ll order it in for you. Don’t wait for your opener problems to intensify. Our team is available seven days a week across Greenwich. Call us today.